Powerhouse. Based on the barebones of the MSI GT70H, DevilTech offers a highly configurable, hellishly potent gaming machine. A number of CPUs ranging from the Intel Core i7-4700MQ to the insanely powerful Core i7-4930XM in combination with a GeForce GTX 770M or a GTX 780M should be more than enough to stir any gamer's blood. As is almost always the case with DevilTech laptops, the Fragbook DTX can be purchased in a number of different configurations, thereby customizing the device to meet almost all possible requirements. Our test device came with an Intel Core i7-4700MQ processor, a quad-core CPU that should be sufficiently fast to drive all current games. It is supported by an Nvidia GeForce GTX 770M high-end GPU, 8 GB of DDR3 RAM and a 120 GB SSD for a price of almost $2000. Obviously, the Fragbook DTX is equipped with a Full HD panel (17.3-inches, matte display) for the best possible video and gaming experience. If money is no object, configurations that are even more powerful can be purchased. 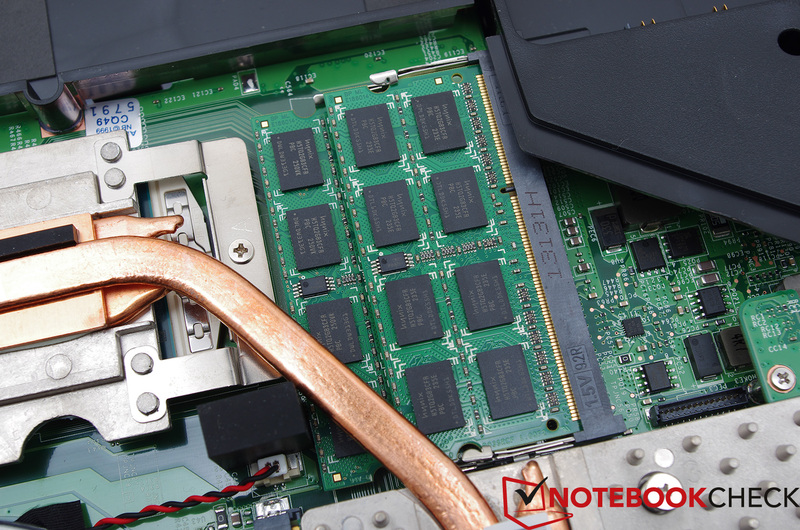 One possible upgrade path is available for the CPU, allowing the user to choose a more future-proof Intel Core i7-4800MQ or a 4900MQ instead - or, for a steep upgrade cost of more than $1000, even an Intel Core i7-4930MX with four cores clocked at 3.0 GHz (with an integrated turbo to up to 3.9 GHz), if the Fragbook DTX is to be used as a work station. 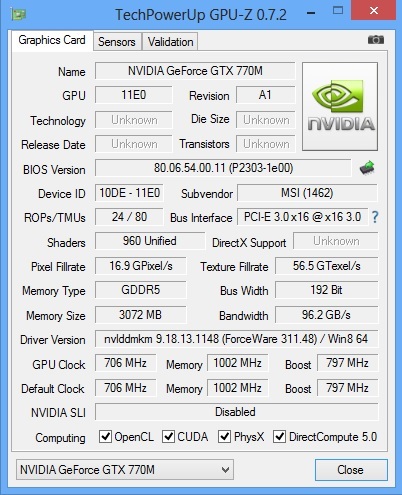 In addition, the pre-defined GeForce GTX 770M can be swapped for a 30% faster GeForce GTX 780M (for $400 more), Nvidia's flagship GPU. In case of the standard configuration, one RAM slot is occupied with 4 GB of memory. This can be swapped for one 8 GB module for a price of approximately $90. In terms of HDDs and SSDs, both options are available. 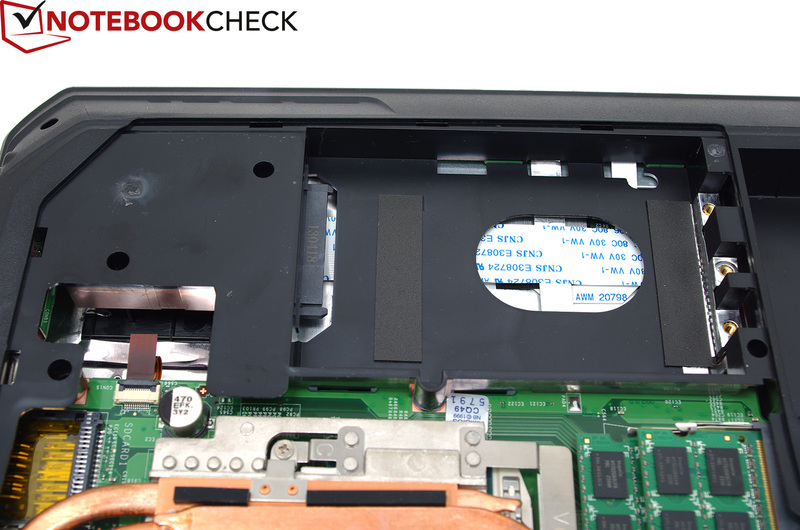 Our test device comes with a 120 GB Samsung SSD 840 (2.5-inches). Higher writing speeds can be achieved when opting for the Samsung 840 Pro (which costs approx. $600 more in the case of the 512 GB version). There is even sufficient space for a second mass storage drive in the MSI MS-1763 barebones. Big, bigger, Fragbook DTX. DevilTech uses the same gigantic chassis as the MSI GT70H that we tested some months ago. 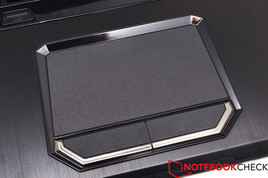 With a height of approximately 6 centimeters (~2.3 inches) and a weight of approximately 3.6 kilograms (~7.9 pounds), this is one of the largest gaming notebooks in existence. There are some minor optical differences, though. Instead of a brushed aluminum lid, the Fragbook DTX uses a surface layer with a brushed-metal look, but made of plastic. 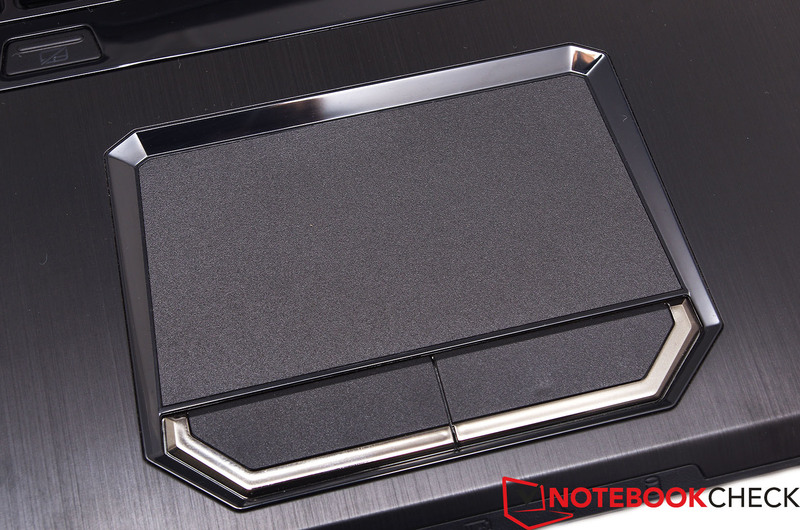 While this is rather fingerprint-proof, it does not yield the same premium look as for the MSI laptop. The matte display frame (the old MS-1762 barebones had a display frame with a black piano finish) works well in combination with the non-reflective display. We are less happy about the upper side of the base unit. While the cool, brushed aluminum palm rest is a welcome addition, the area surrounding the keyboard is again made from plastic - highly reflective plastic with a black piano finish, which is extremely prone to accumulating fingerprints, dirt and dust. Another disadvantage: The extremely bulky chassis. 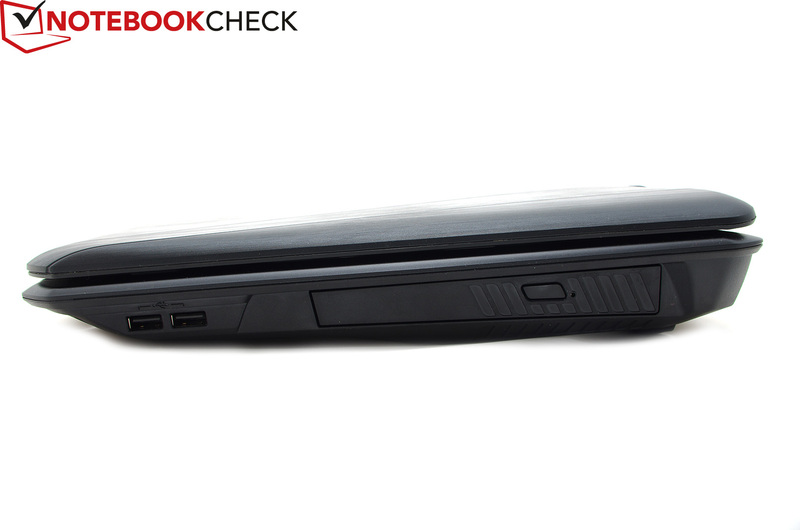 With a height of 6.1 cm, a width of 43.4 (~2.4” h, 17” w) and a weight of 3.65 kilograms (eight pounds including the battery), the Fragbook is no truly mobile device, but a colossus among gaming laptops. Even the gigantic power adapter (180 Watts) weighs another 858 grams (~1.9 pounds). 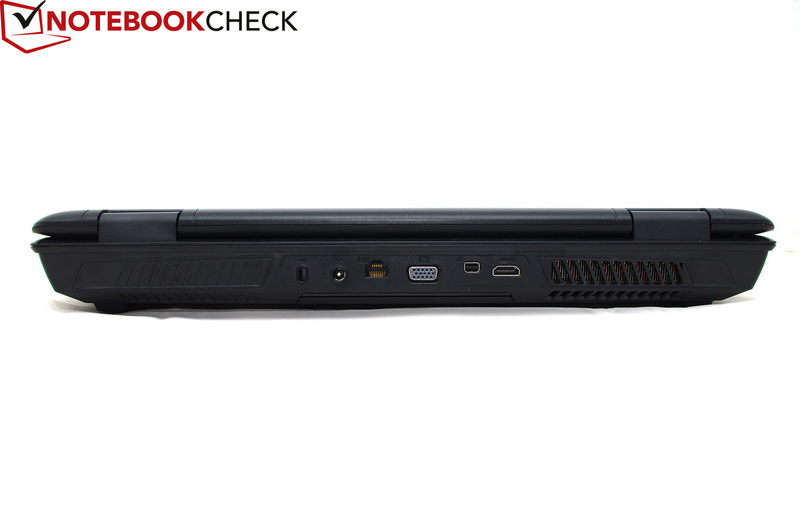 Thus, like the MSI GT70, the Fragbook is better suited as a desktop replacement than as a mobile companion. Still, the sturdy construction has its advantages: The chassis is very torsion- and pressure-resistant, even though it can barely be lifted by just one hand. The area beneath the keyboard is the only one where the base unit began to sag a bit when enough pressure was applied. On the lower side, a surprisingly large maintenance hatch can be found which can easily be opened. 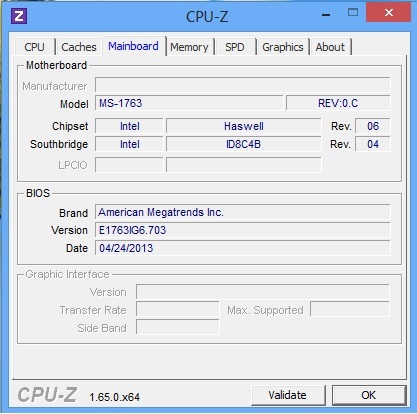 Here, hardware components such as the hard drive disk or the RAM module can be accessed. Such a large high-end gaming laptop simply has to ship with a large variety of ports - and the DevilTech Fragbook DTX (mostly) delivers. Still, the unfavorable shape of the chassis with its protruding edges leads to the ports on the side being barely accessible, as it is hard to see where exactly a flash drive has to be put. The multitude of ports is commendable: A total of three USB 3.0 ports can be found on the left hand side next to an SD card reader and a comprehensive set of audio ports. Most of these are close to the center of the chassis, which is still an acceptable distribution. 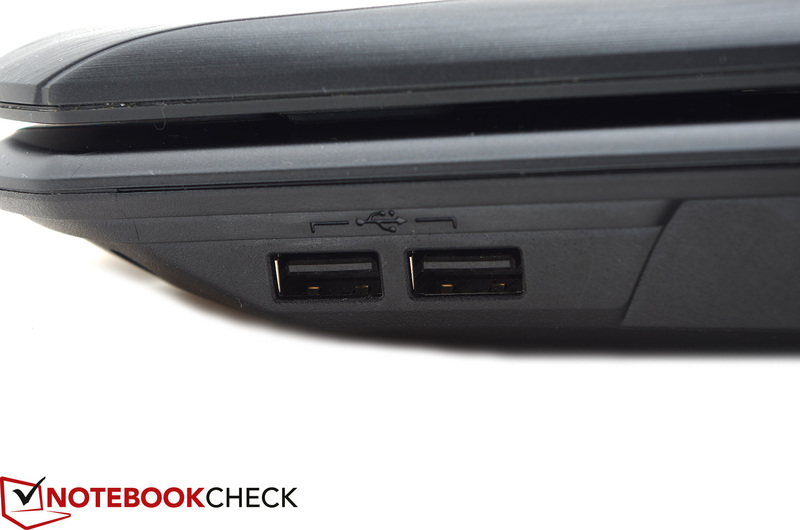 On the right, two USB 2.0 ports are located close to the front, which can get in the way when using a mouse. 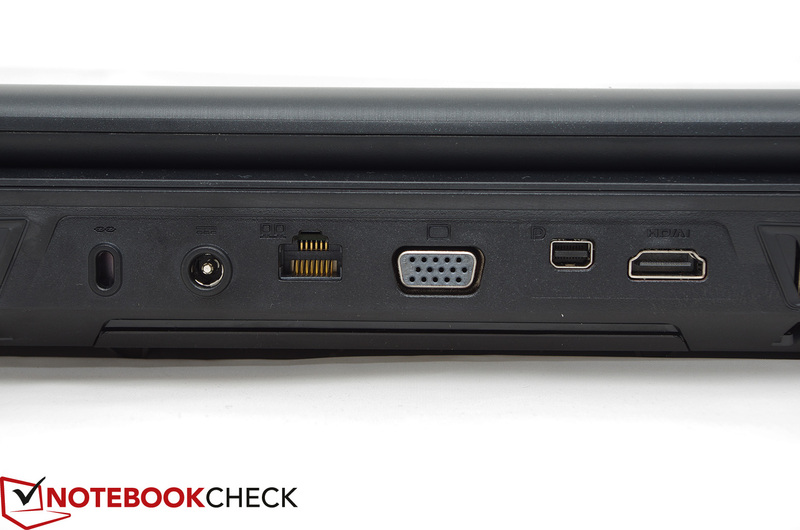 On the rear, HDMI, Mini DisplayPort and VGA ports can be found. This means that the laptop is capable of driving up to three displays (with the built-in display being counted as well). Very much noticeable: Not only are headphone and microphone ports built into the device, but additionally a Line In and a Line Out port. Thus, the laptop is capable of full 7.1 surround sound output. The Fragbook comes with a Qualcomm communication monopoly. Next to the Gigabit Ethernet controller Killer e2200, the laptop is also equipped with a Killer Wireless-N 1202 Wi-Fi card. 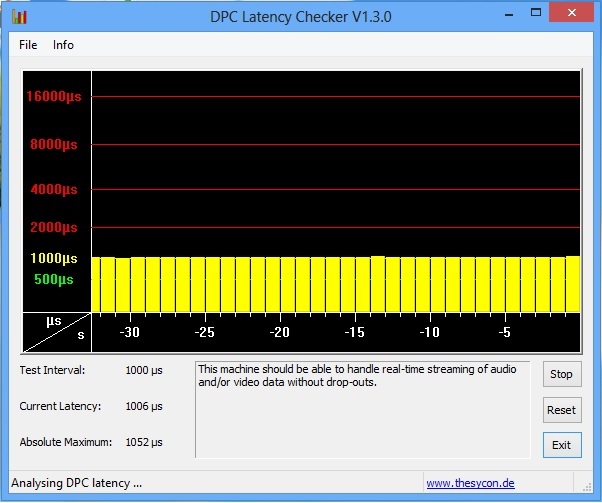 With the help of a tool that can be downloaded from the manufacturer's website, users can define and control the latencies of games and programs. We must say that we were a bit disappointed about the effective range. 10 meters (~33 feet) away from the router, we were down to three or four bars of signal strength - and none once we put 20 meters (~66 feet) between the router and us. There is not much to say here. No special software tools (apart from the operating system and the necessary drivers) or accessories (apart from the power adapter and the power cable) are included. While MSI's variant comes with a number of useful tools like PowerDVD 10 and a trial version of Microsoft Office, nothing like this ship with the Fragbook DTX. One of the main advantages of any barebones is not only the sophisticated cooling system, but also its maintenance and upgrade capabilities. 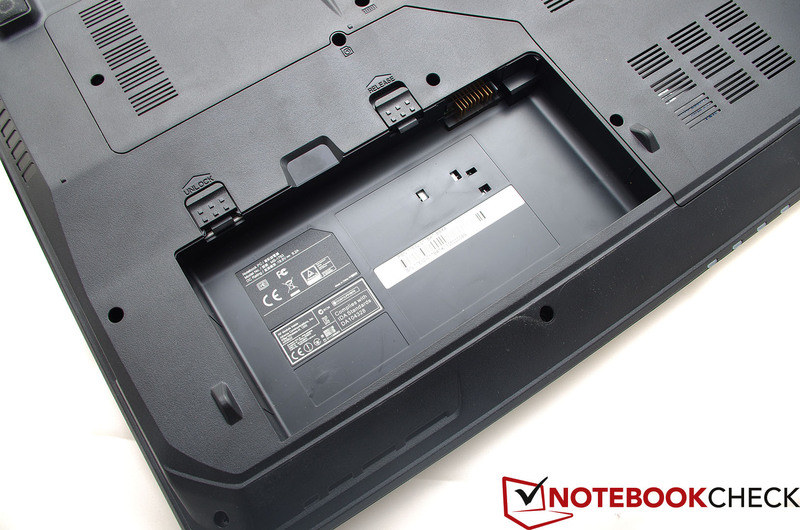 A large-sized maintenance hatch beneath the laptop allows users easy access to its internals. Most importantly, there is a free second drive bay (a bit away from the rest of the main system components). The two primary RAM slots are located in the immediate vicinity of the cooling system while the other two can be found beneath the keyboard. 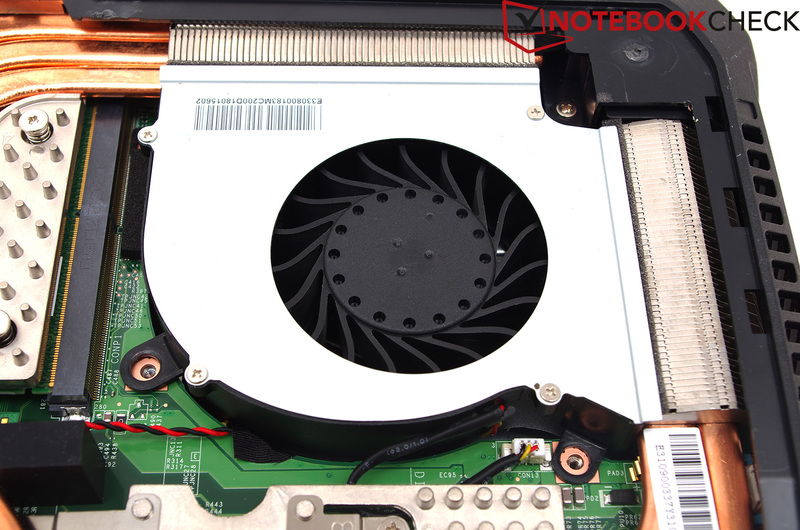 As is the case with the MSI GT70, the GPU and the CPU are cooled by the same fan that dissipates heat via a heat pipe system. All three items, the CPU, the GPU and the fan, can be removed if necessary - making any cleaning endeavor so much easier. 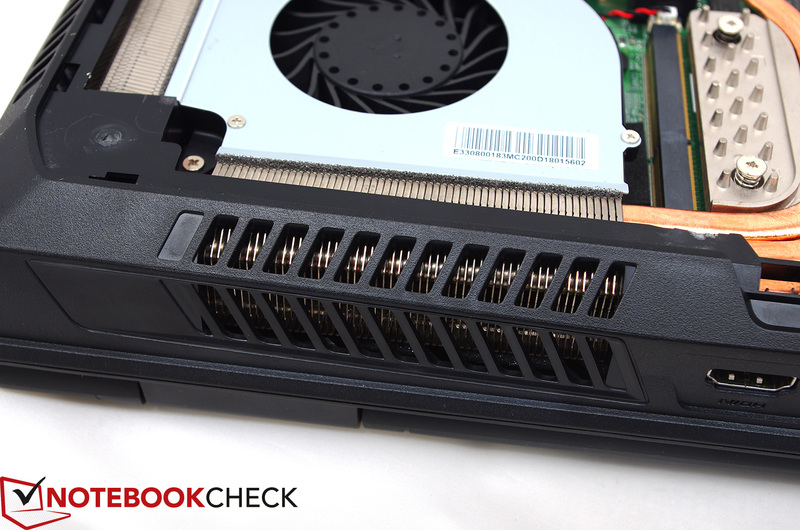 Even the keyboard can be removed for cleaning purposes (a short guide can be found within our review of the MSI GT70). The Fragbook DTX ships with 24 months of warranty. This can be extended by another year (to 36 months) for a one-time fee of around $200. 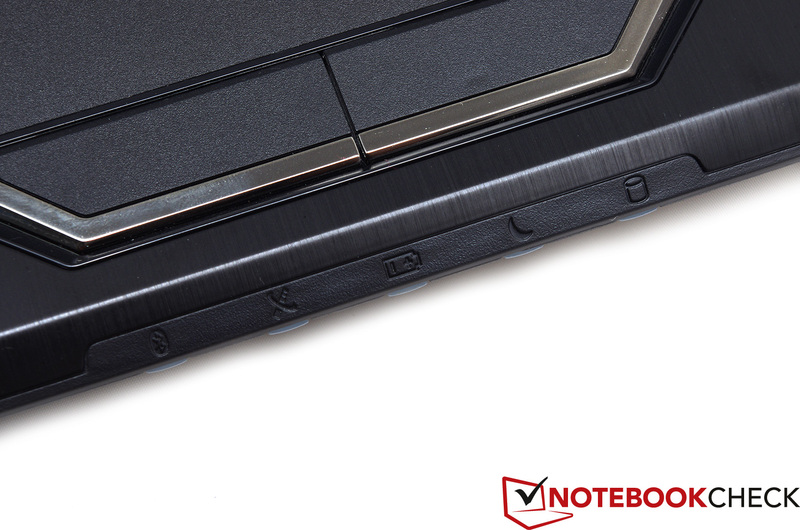 Despite the many similarities between the case of the Fragbook DTX and that of the MSI GT70, they both sport different keyboards. No "Keyboard by SteelSeries" branding, no noticeable "Triple LED" backlighting - the only color option for the illumination of the keyboard is blue. Both do, however, sport the same keyboard layout. 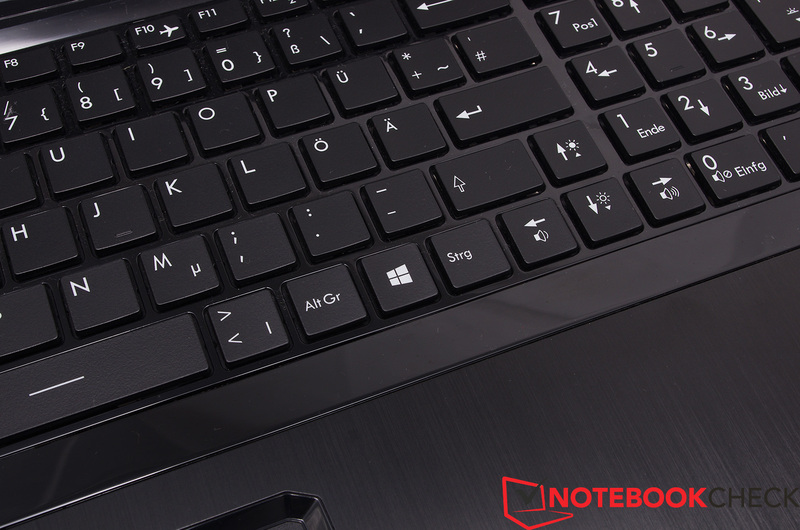 The Windows key, for example, is on the right hand side of the spacebar, as are the <>-keys. It might take some time getting used to these adjustments, especially for prolific writers. The function keys are well thought out. Brightness and volume can quickly be adjusted by pressing Fn + arrow keys. 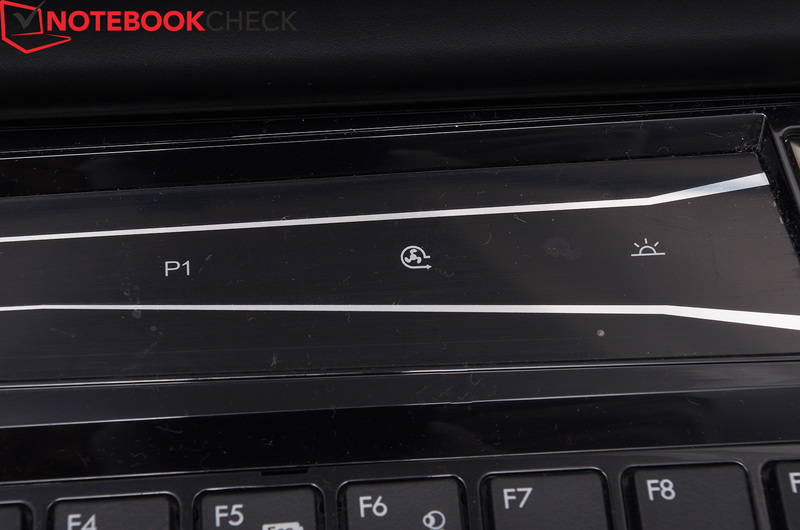 A number of touch-sensitive areas are located right above the keyboard. 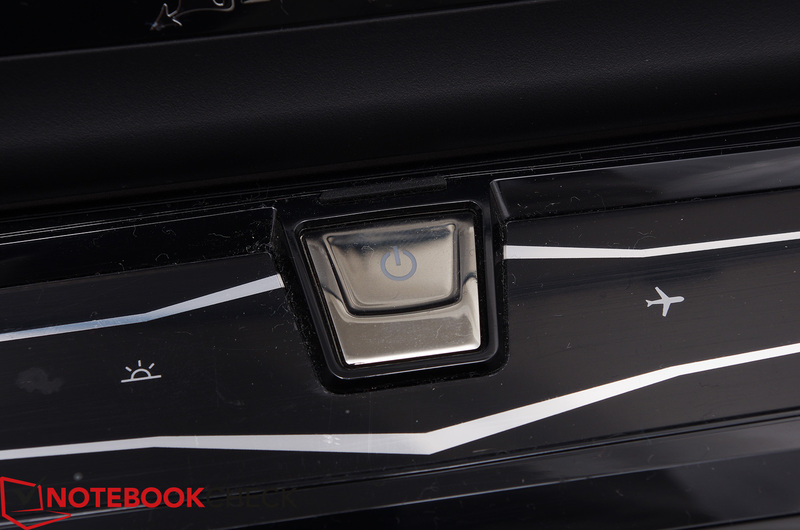 These can be used to toggle the keyboard backlighting, the fan boost or the airplane mode. The program key P1 is fully customizable. As mentioned, users who are not familiar with MSI keyboards will have to invest some time. Once this hurdle is taken, the keyboard layout feels rather sophisticated and un-cluttered. Typing on the chiclet-style keyboard is audible, being accompanied by noticeable feedback. Unfortunately, the base unit is prone to yield by a few millimeters while typing, which may lead to a spongy impression at times. 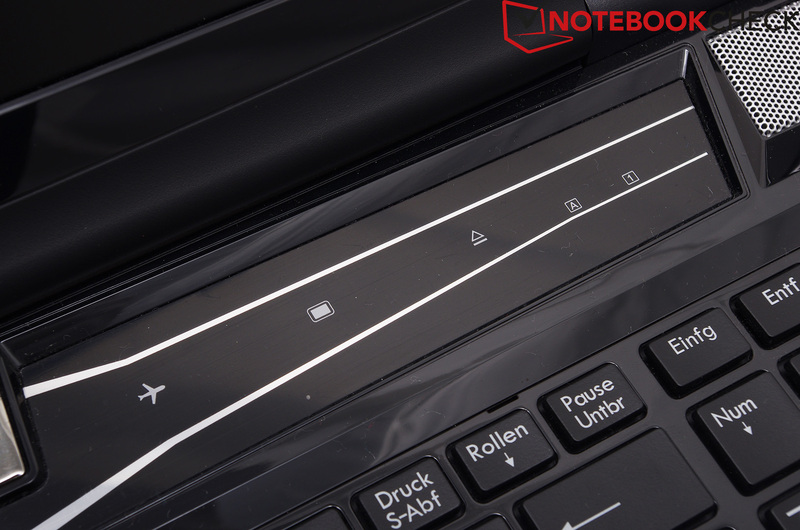 The touchpad of the Fragbook DTX works well, among other things thanks to its slightly rough surface that prevents the sticky feeling many other touchpads have (especially during the summer) and helps with a lag-free input experience. 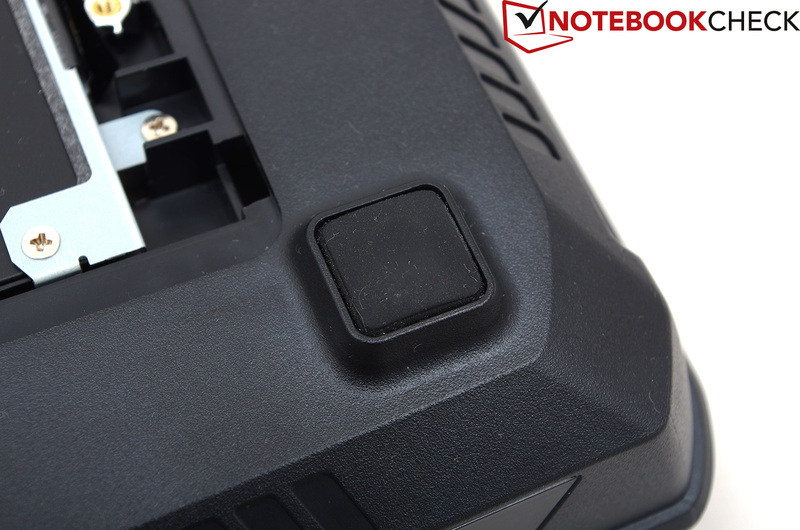 It is embedded into the base unit (recessed by a few millimeters) and separated from the mouse buttons. The only major downside is its small size: 84 x 42 millimeters (~3.3 x 1.7 inches) is not very much for a 17-inch device. 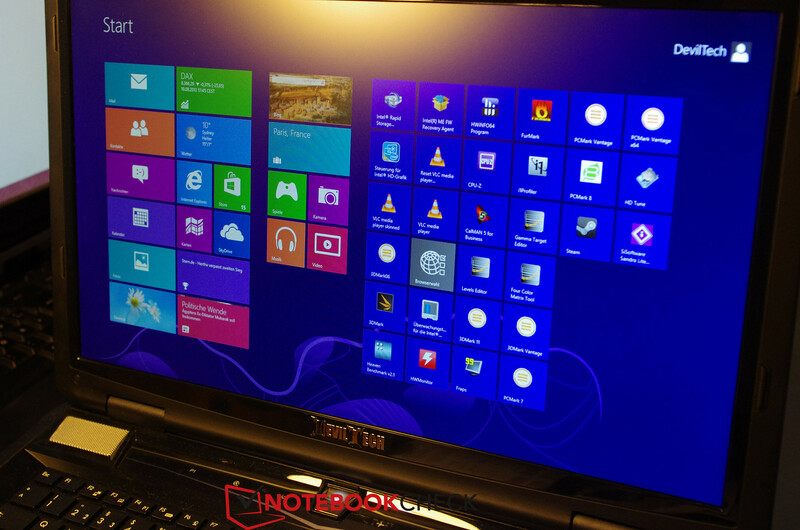 In addition, in its delivery condition, the Fragbook DTX lacks a number of crucial drivers, not supporting any Windows 8 gestures like rotating, zooming and scrolling in Windows 8. The keyboard layout takes some getting used to. The touchpad is slightly roughened and very precise. 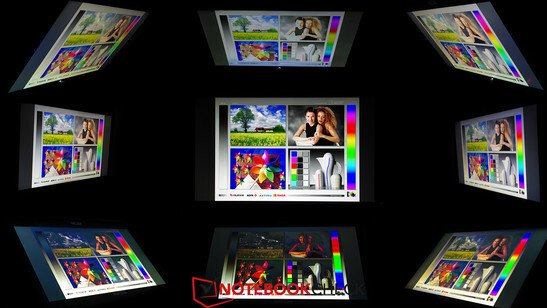 The Fragbook DTX sports the same Full HD Chi Mei N173HGE-L11 display as its 17-inch brethren, the MSI GT70 and the GE70. It sports a high peak brightness, a high contrast ratio and a resolution of 1920x1080 pixels. Up to 342 cd/m² are reached in the lower center of the screen. The average brightness comes close to 300 cd/m² - a very decent value, which is approximately on par with that of Clevo's P170SM and P177SM barebones. Its brightness homogeneity value of 79% is more of a problem. The right hand center is darkest, with just 271 cd/m². Luckily, thanks to the high overall brightness, these differences are not very noticeable. 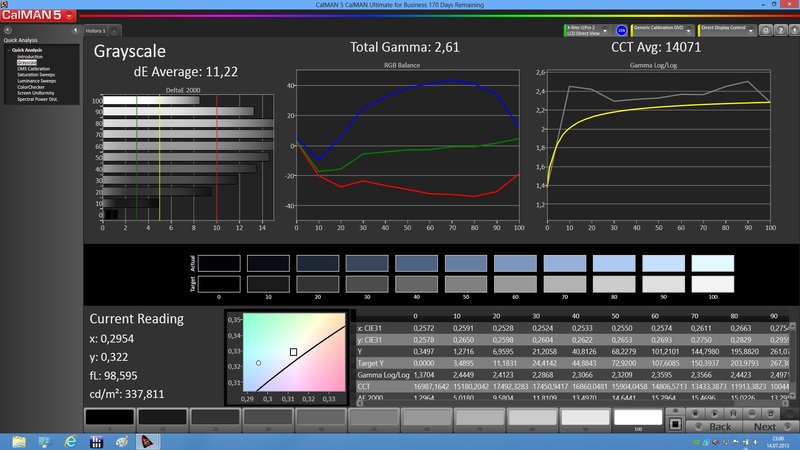 Plus, its black levels of around 0.31 cd/m² are extremely good, leading to vivid blacks. Thus, a great contrast ratio of 977:1 results. 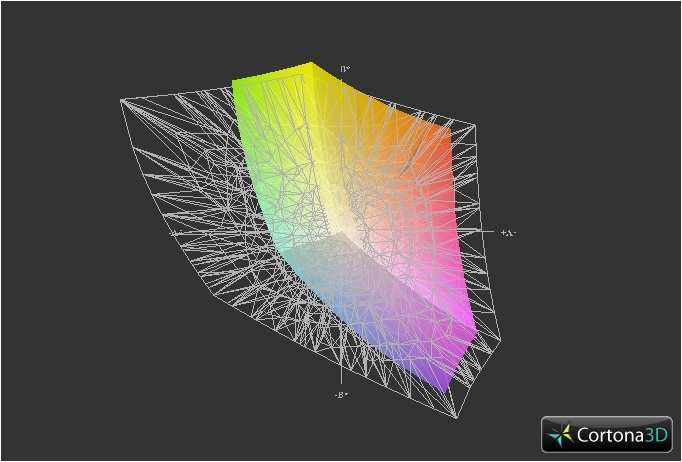 Image rendition is very good, too, with vivid colors. Unfortunately, a strong blue tint leads to cool color temperatures of suboptimal 7707 Kelvin. 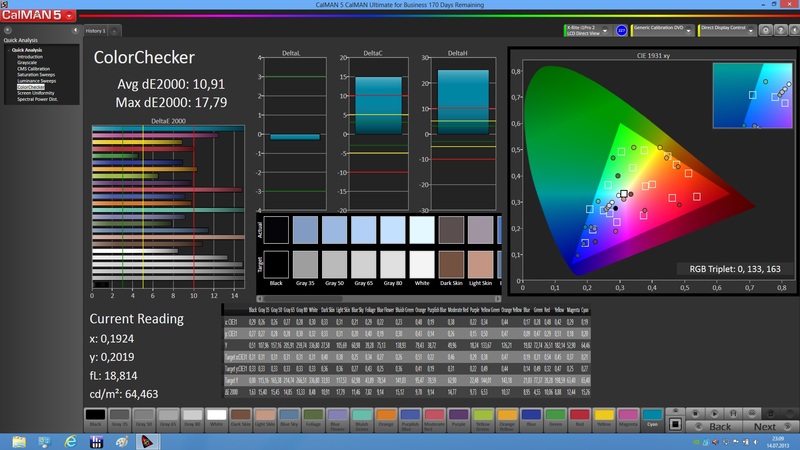 Color space rendition is mediocre (57% in Adobe RGB, 83% in sRGB), but then again, this is only relevant for professional graphic designers. The display remains useable even directly under light sources. 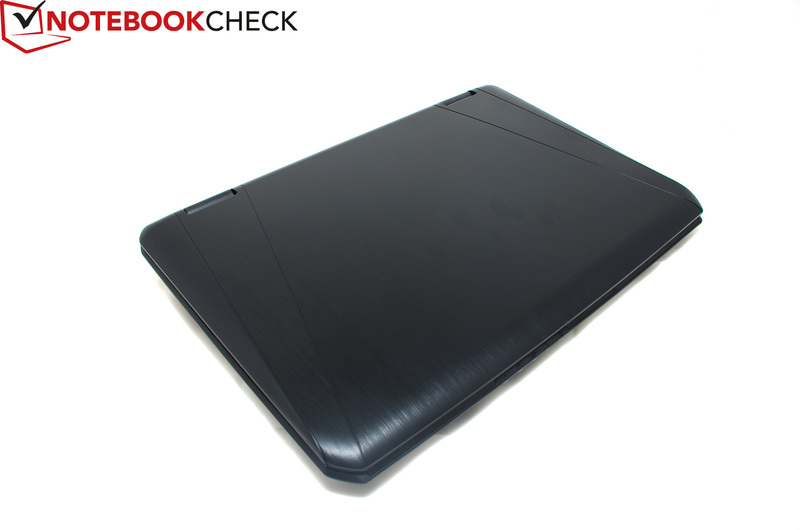 Thanks to its high brightness, the Fragbook can be used outdoors as well. 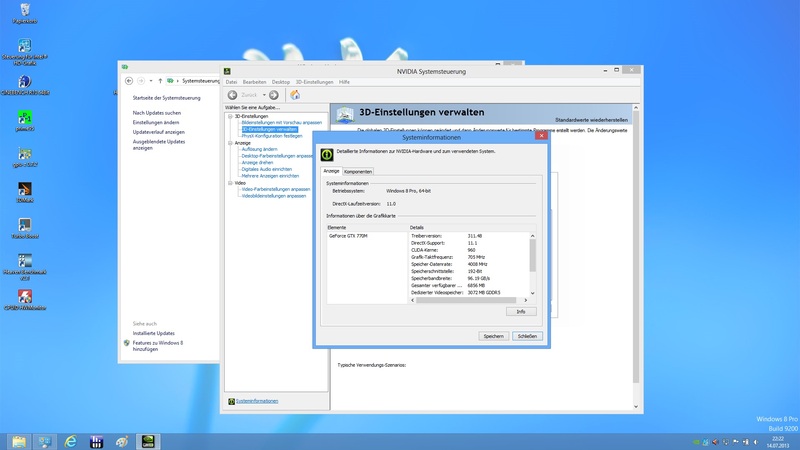 Both during actual work in the Windows UI as well as during gaming, all screen contents remain visible. 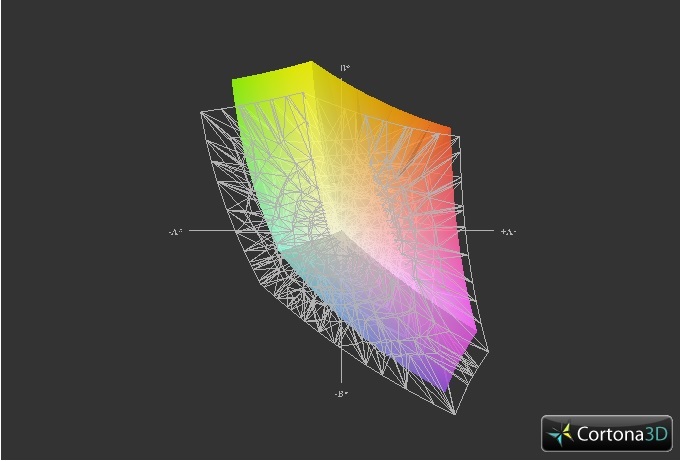 Its viewing angle stability is above average (comparing it to other TN displays). Colors do wash out when looked at from the sides, but this is typical for a TN panel. They are distorted when vertical deviations come into play. 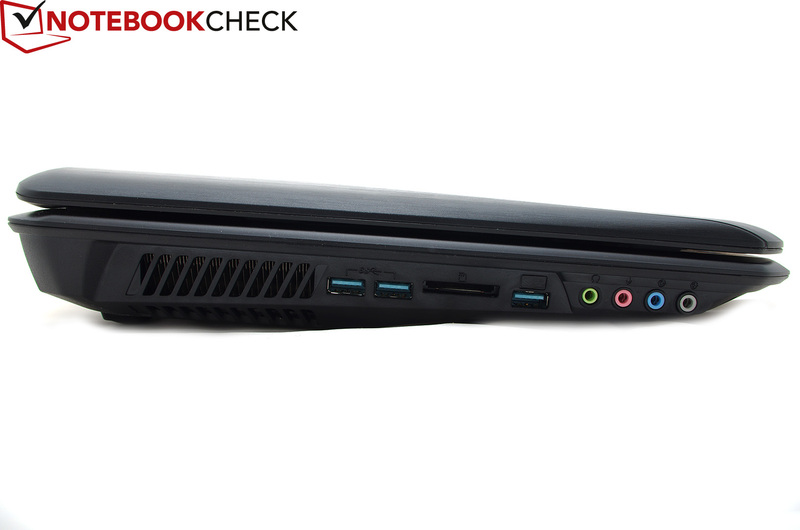 The Fragbook DTX is powered by a fast Intel Core i7-4700MQ processor, a quad-core CPU with 6 MB of cache and a maximum Turbo Boost clock speed of up to 3.4 GHz. 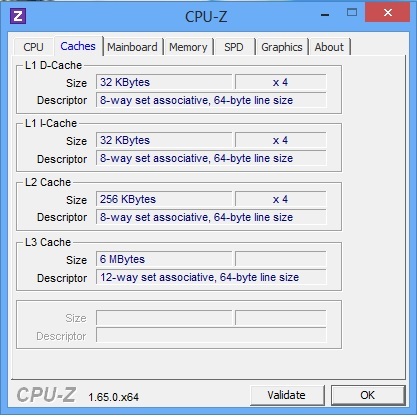 Intel's Hyperthreading technology (which accelerates parallel computations) is also implemented, allowing for another four virtual threads to be used. When the dedicated GeForce GTX 770M is not needed, Nvidia's Optimus technology allows for a fallback to the integrated Intel HD Graphics 4600, which is more than adequate for handling web applications or Blu-Ray playback. This leads to improvements in battery life, especially when browsing the web or working in MS Office. One great little detail: The color of the power button LED shows whether Nvidia's GPU (orange) or the Intel HD Graphics (white) is active right now. Our test device came with a 120 GB Samsung 840 SSD, but it is also possible to choose a faster, larger 840 Pro, Crucial or Intel SSD instead. Even while running on battery, the maximum Turbo Boost speed is reached. 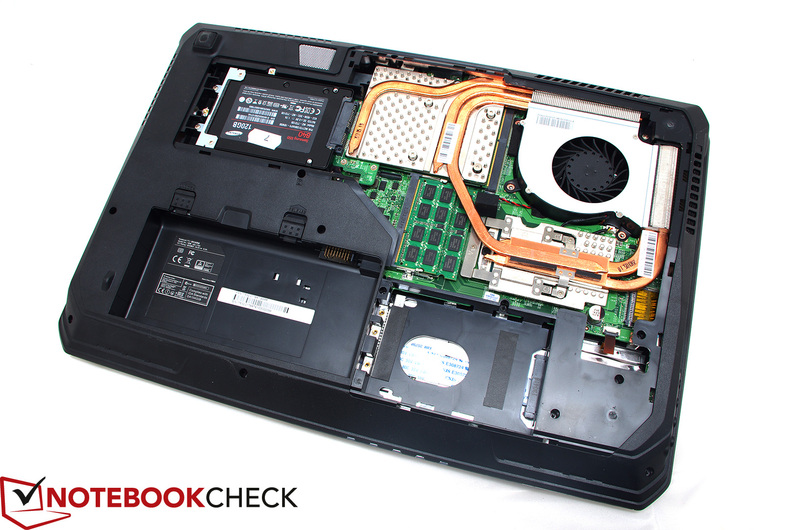 The Fragbook DTX comes with a potent CPU, more than fast enough for all recent computer games. 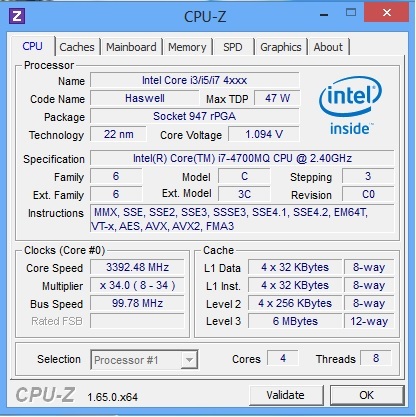 The Intel Core i7-4700MQ is approximately 5-10% faster than its direct predecessor, the Core i7-3630QM. 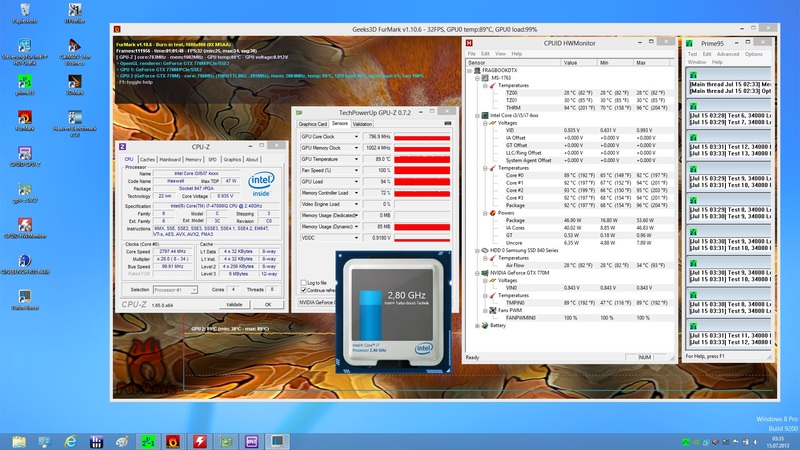 During the Cinebench R11.5 benchmark, the Core i7-4700MQ manages to retain a clock speed of at least 3.2 GHz, probably thanks to the bulky case with its large cooling system. Because of this, the Fragbook DTX beats other laptops with the same CPU, e.g. 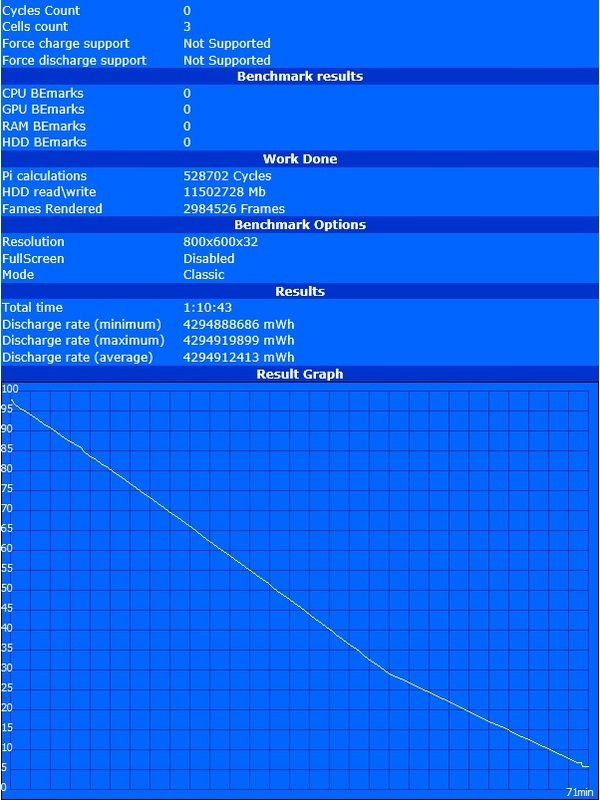 the smaller MSI GE70-i765M287 is slower by approximately 5%. 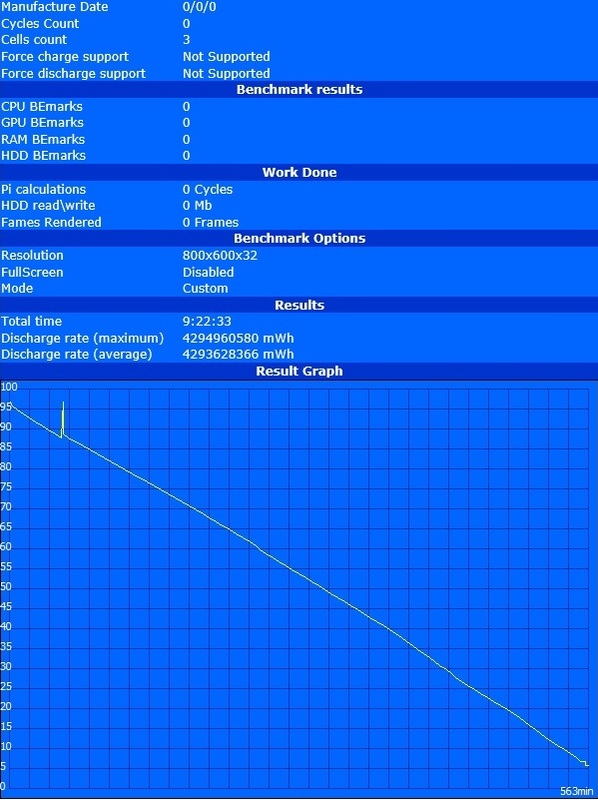 Quite remarkable: Even while running on battery, the laptop does not experience any throttling issues, yielding the same Cinebench R11.5 results as while connected to a power outlet. The battery might not last long under these conditions, but while it does, it offers the full gaming experience. Thanks to its combination of a potent CPU, a high-end GPU and a fast SSD, the Fragbook DTX almost manages to take the lead concerning its PCMark results. 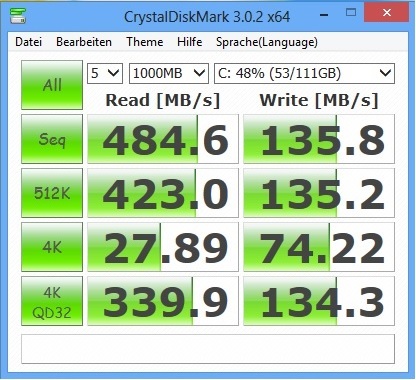 With 5664 points - there is barely any laptop that manages to go faster (the Schenker XMG A523, a 15.6-inch desktop replacement, yields 5944 points due to its faster Crucial SSD, only a slight advantage of 5% when compared to the Fragbook DTX). 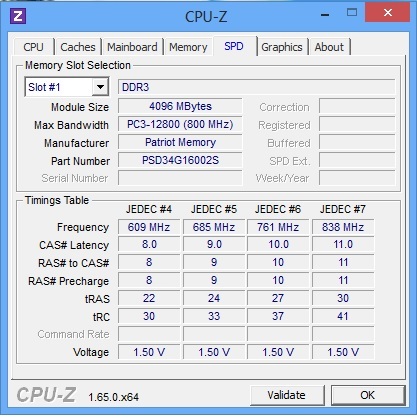 Even under full load with Prime95, the DevilTech laptop still offers peak performance. 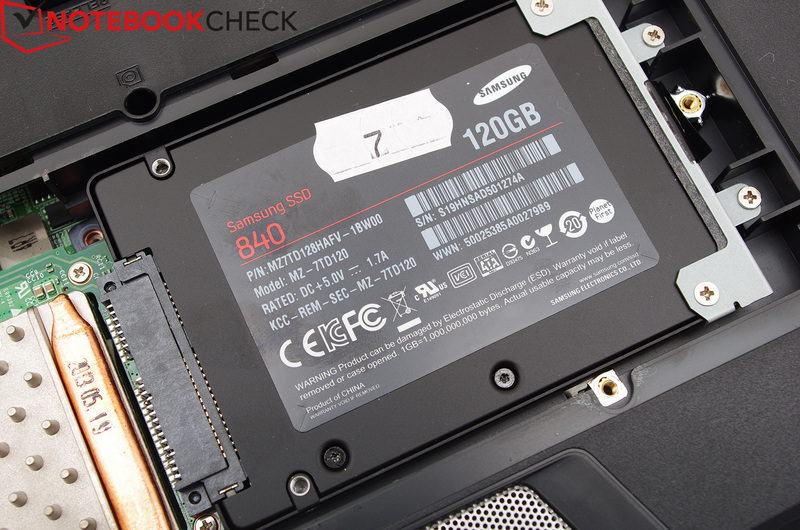 The Samsung 840 is the perfect bang for the buck when it comes to SSDs. 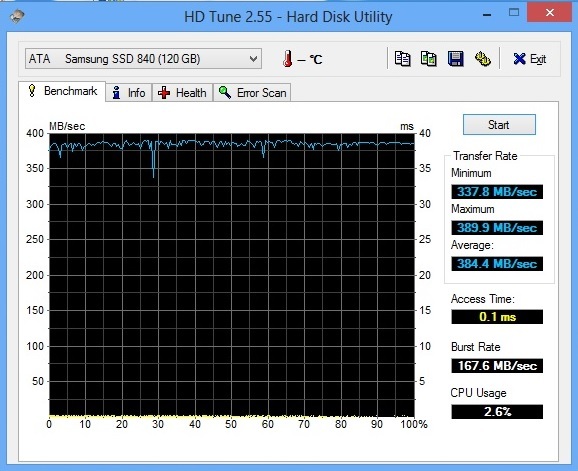 Its great data transfer speeds (especially while reading data, the writing speeds are "just" average for an SSD) are crucial in reducing loading times. Those in need of higher read and write speeds might want to upgrade to a Samsung 840 Pro or a Crucial M500. A mechanical hard drive can also be added as a data storage device. A 1000 GB HDD costs approximately $100 (the exact price depends on its speed). 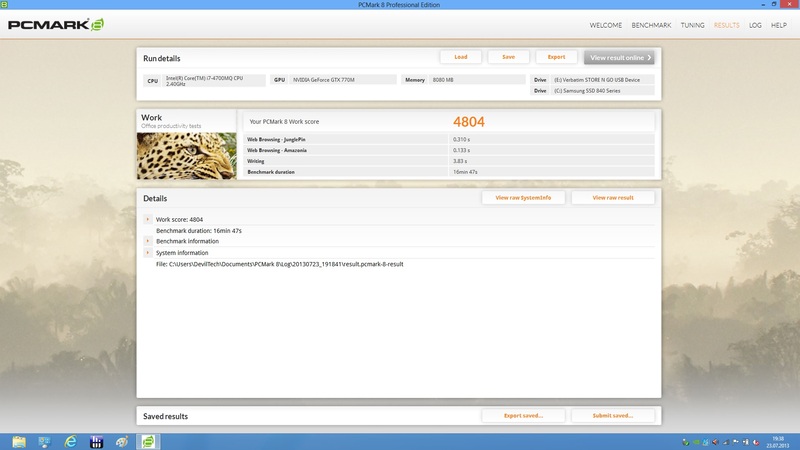 Our test device comes with a high-end Nvidia GeForce GTX 770M GPU based on the GK106 chip with Kepler architecture. It is manufactured by TSMC using a 28nm process. 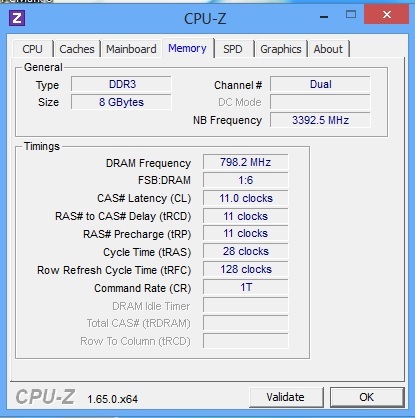 When the GTX 770M is compared to its predecessor, the clock speed is found to have been increased. Thanks to Nvidia's GPU boost, the graphics card can be overclocked to up to 862 GHz (according to GPU-Z) when this becomes necessary. During lighter loads, the integrated HD Graphics 4600 GPU takes its place. 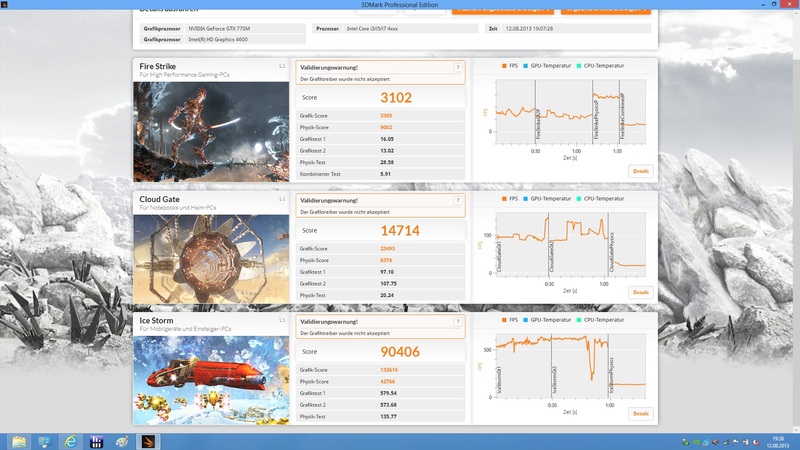 It is even powerful enough to drive older games and more recent titles with low enough resolutions, reaching a decent value of 1181 points in 3DMark 11. Of course, the system switches back to the dedicated GPU once more demanding applications are run. 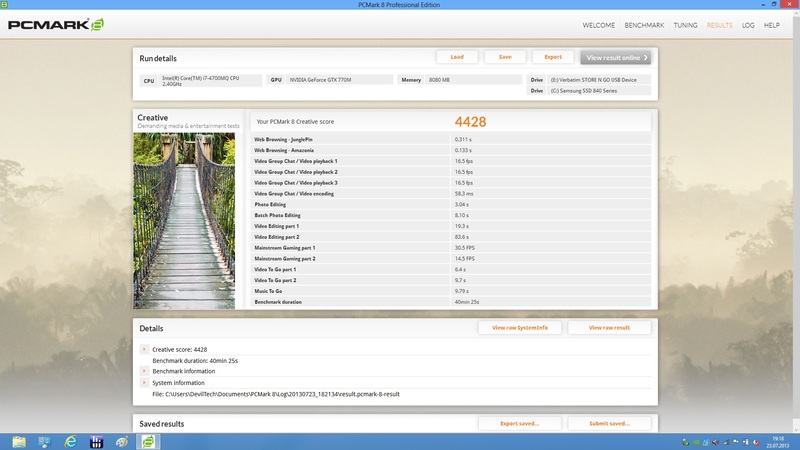 The actual gaming graphics card, the GeForce GTX 770M, yields a good 3DMark 11 result of 5187 points. While the competition may be a little bit faster (5389 points for the One K73-3N), this is well within the tolerance range. The GPU is capable of profiting from the same great cooling system and the same bulky chassis as the CPU: Even after several hours of stress tests, a core clock speed of around 800 MHz is retained, while the temperature barely exceeds 90 degrees Celsius (194 degrees Fahrenheit). Unsurprisingly, the Fragbook DTX is first and foremost a gaming machine, with a great (and well-balanced) combination of a quad-core CPU and a GeForce GTX 770M which should satisfy most gamers. And indeed, the Fragbook DTX is capable of yielding up to 43.7 fps when playing the high-end game Metro: Last Light - this is 30% more than what the MSI GE70 manages to achieve with its GeForce GTX 765M, and smooth enough. It takes maximum details and a resolution of 1920x1080 pixels to push the frame rate down to unplayable 23.8 fps. 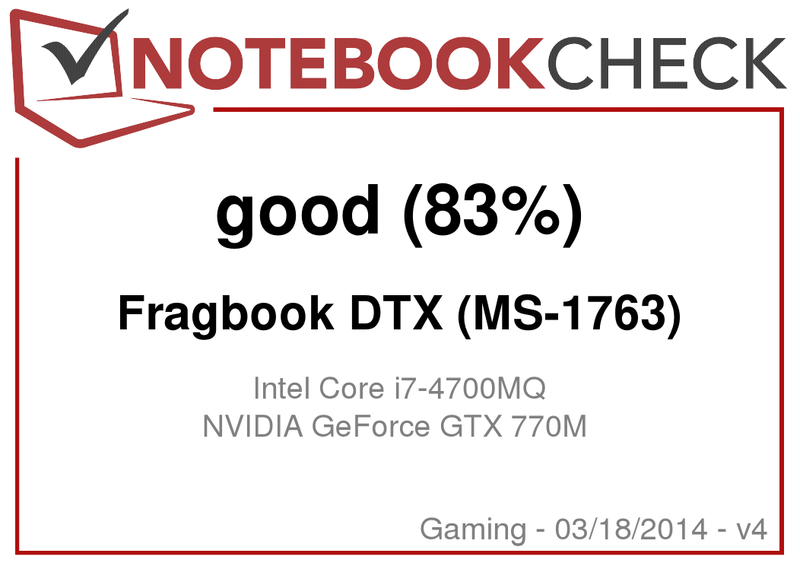 Still, it is noticeable that the Fragbook DTX manages to beat the similarly equipped MSI GT70 2OC-065US by 6-8% in both settings. Things turned out a bit differently while running Company of Heroes 2. 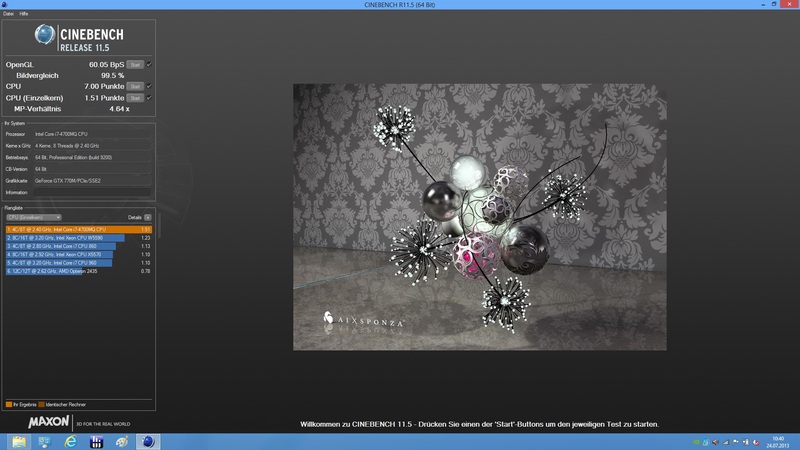 Here, the DTX reached 29.7 fps (with a resolution of 1366x768 and everything set to "high"), 5-9% less than competitors such as the MSI GT70 2OC-065US or the One K73-3N. The same held true when the integrated benchmark was run under maximum details and Full HD resolution. 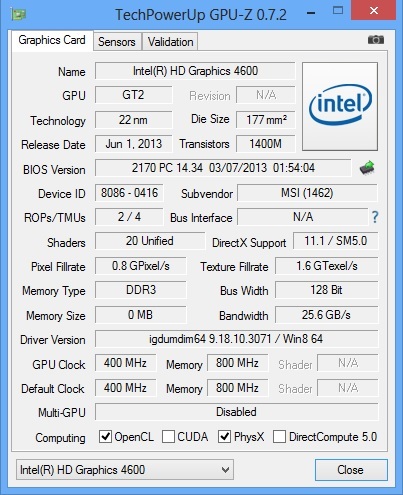 The 14.5 fps of the Fragbook DTX were slightly behind the One K73-3N and the MSI GT70 2OC-065US. 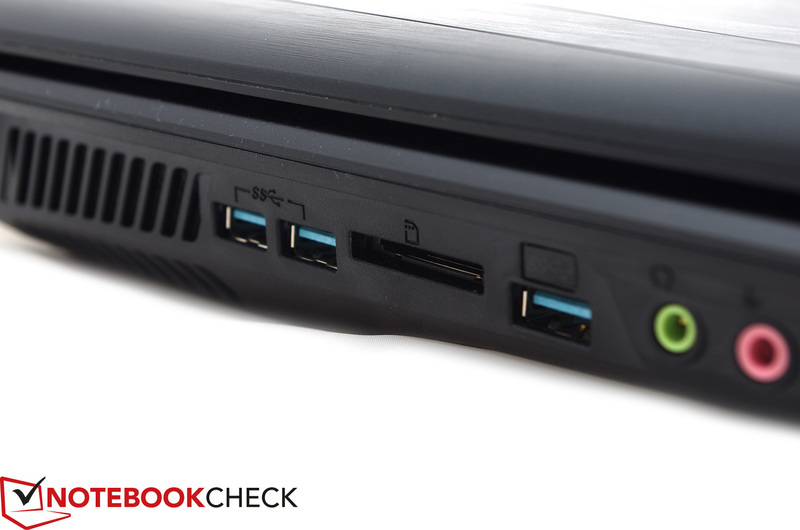 Still, the DevilTech laptop offers an extremely good gaming performance. 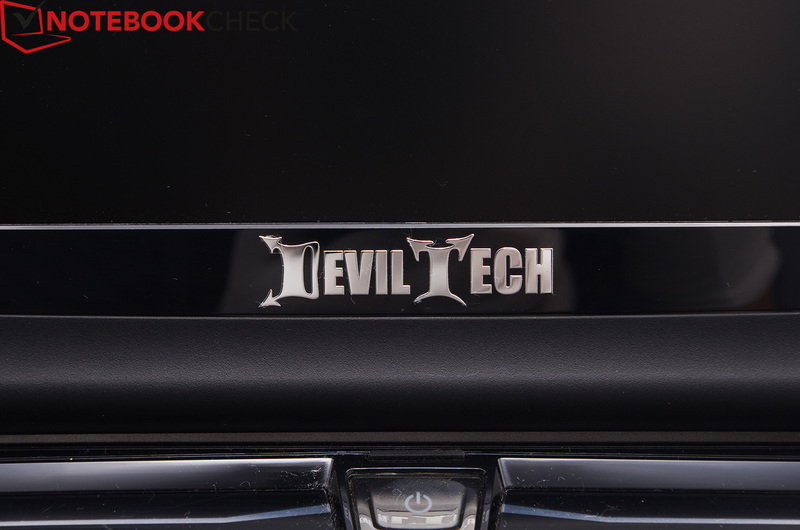 Despite its potent hardware, the DevilTech Fragbook DTX remains astonishingly quiet while idle. 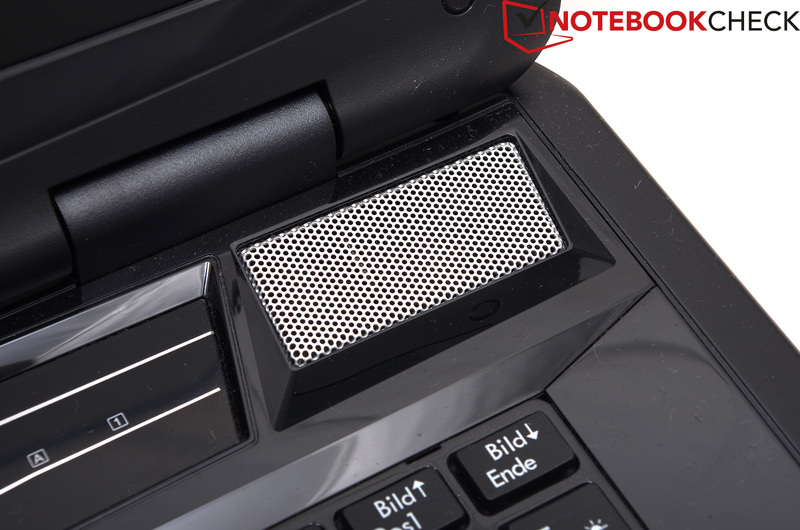 Thanks to its silent SSD and the smoothly running fan, it barely exceeds 30 dB(A). During DVD playback, decent 35 dB(A) are reached. Only when challenging 3D applications are run, does the Fragbook DTX show its full power, getting up to 47 dB(A) loud (just 35 dB(A) during 3DMark 06). Once the Cooler Booster function is activated, more than 50 dB(A) can be reached. However, this is usually unnecessary since the internal temperatures never get exceedingly hot, even during gaming sessions or during our stress tests. After we have had disappointing experiences with MSI barebones (DevilTech Fire DT14 and MSI GE70), we are pleased about our findings here. The metal-made palm rest always stays comfortably cool, even under full load (31 degrees Celsius/87.8 Fahrenheit). Even the rest of the chassis fares well. During our stress tests, up to 49 degrees (120.2 Fahrenheit) were reached in the upper left corner, but during real-life gaming, even this area stays much cooler. There is no place warmer than 30 degrees (86 Fahrenheit) while the laptop is idle. All of this is quite an astonishing feat given that the GPU and CPU got rather hot (96 degrees and 90 degrees (204.8 and 194 Fahrenheit) respectively during the stress tests). (±) The average temperature of the palmrest area of similar devices was 28.7 °C / 83.7 F (-1.8 °C / -3.2 F). Usually, such a bulky chassis should serve as more than enough resonance space, but unfortunately, the sound quality of the DevilTech Fragbook leaves quite a bit to be desired. While its audio quality is decent, offering sufficient bass as well, more potential would have been there. It should be enough for games or some background music, but those fond of a great audio experience might want to invest in an external sound system. 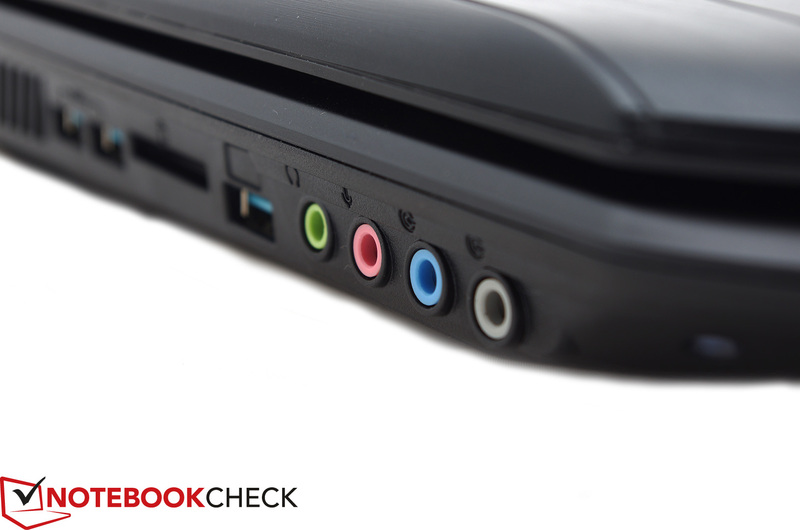 Thanks to its four audio jacks, the Fragbook DTX is perfectly capable of being hooked up to a full 7.1 surround system. The power adapter weighs 900 grams (~2 pounds), supplying the laptop with up to 180 Watts of power. This is actually not an absurd choice since the DTX needs up to 163 Watts under full load. Still, the laptop is also capable of being much more energy efficient. 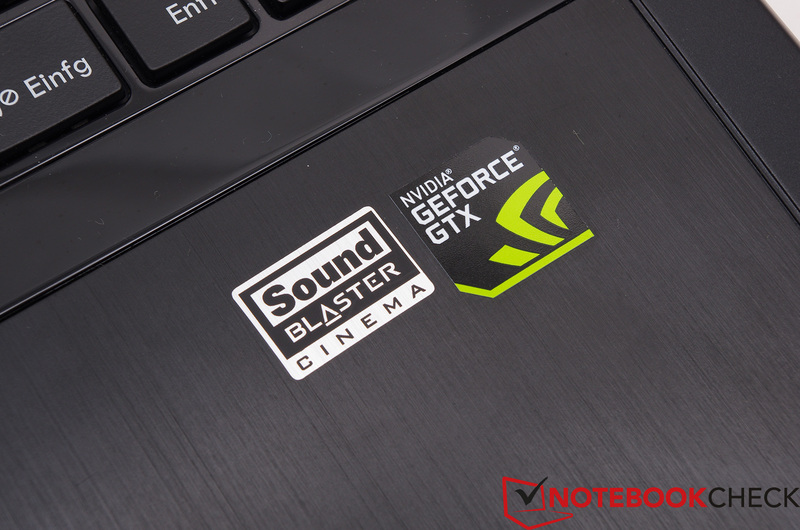 While idle, only seven Watts are required (which is even less than the better-equipped MSI GT70) and even on Wi-Fi and with maximum brightness, other 17-inch gaming laptops like the MSI GE70 or the GT70 remain more power-hungry. 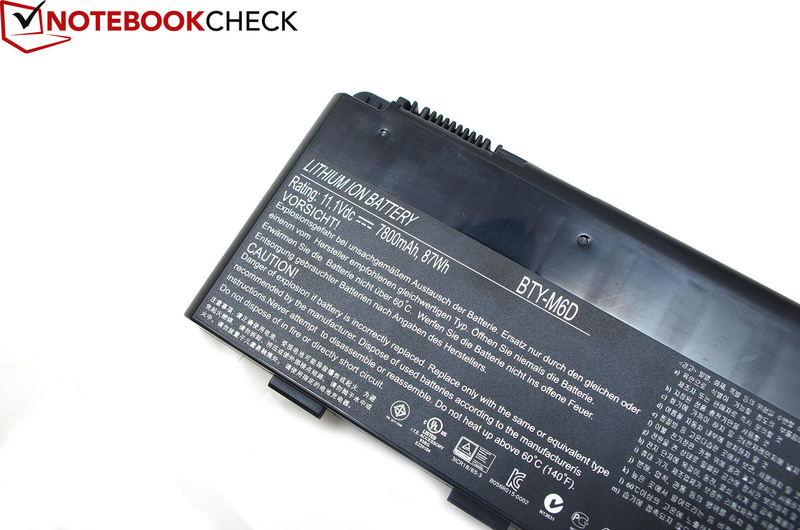 These moderate power consumption levels do of course help to increase the laptop's battery life. 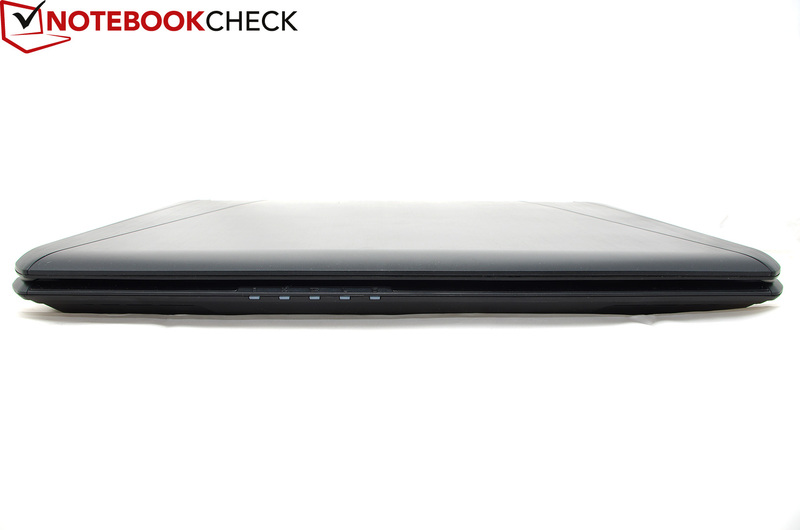 Thanks to its large 87 Wh battery, the Fragbook DTX offers a running time of 9.5 hours while idle. These numbers dwindle, depending on the usage scenario. Still, 6.5 hours while browsing the web (medium display brightness) is very decent, as is 4 hours of DVD playback (maximum display brightness). It is only the 3D applications that truly push the system to its limits, reducing the battery runtime down to around 1 hour - which is even less than what the MSI GT70 offers with its GeForce GTX 780M. Potent gaming laptop with a lot of stamina. Gamers are in need of impeccable, stutter-free performance. 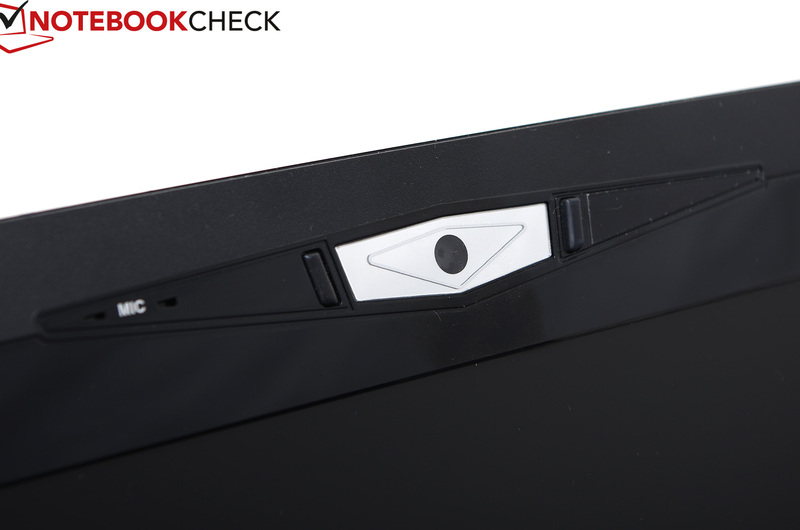 Indeed, this is the strong suit of the DevilTech Fragbook DTX, a well-balanced gaming laptop with a bright high-contrast display. While a nominally inferior panel has been used (also with a small bluish tint), the image quality of the Fragbook DTX actually manages to come very close to its IPS-based competitors. Even these minor shortcomings are quickly forgotten thanks to the potent hardware. Both the Intel Core i7-4700MQ and the dedicated GeForce GTX 770M are not only well balanced, but also powerful enough to be able to render any current 3D game. Besides, more expensive configuration options in the DevilTech shop yield even better performance levels. It might just take some time to get used to the unorthodox keyboard layout. Luckily, not only the hardware is top-notch. The same holds true for the case temperatures, the near-perfect power consumption rate while idle and the battery life of the laptop. If it were not so enormously heavy, the Fragbook DTX might have been the perfect gaming companion. 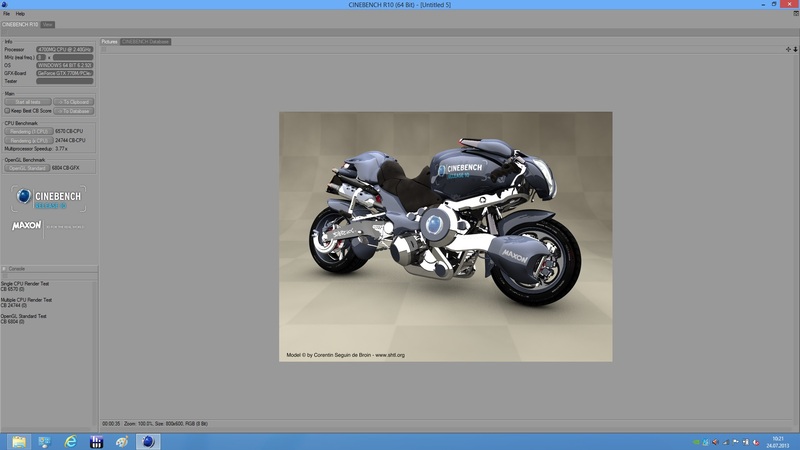 Those who are in need of a powerful desktop replacement system should definitely have a closer look at the Fragbook DTX. The chassis resembles that of the MSI GT70. The power button LED shows whether the integrated or the dedicated GPU is active. Touch-sensitive areas for simpler input. Here, the Cooler Booster can be activated. The speaker aren't bad, but they could have been much stronger given the available resonance space. Below the touchpad are status LEDs. It's got everything a gamer might desire. 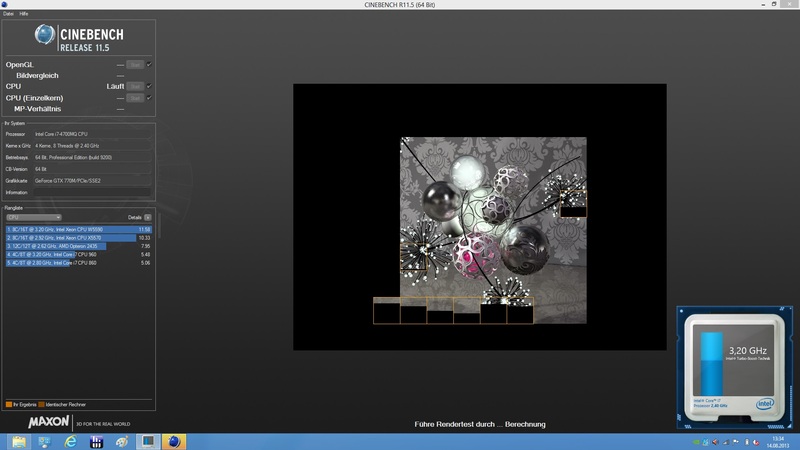 Of course, there is also a webcam (HD resolution). The lid is kept in a minimalistic style. The audio panel enables the user to connect surround sound systems. 3x USB 3.0 on the left hand side. The barebone is extraordinarily high: 6cm. The optical drive is at the right hand side. The USB 2.0 ports are close to the front. On the rear, external displays can be connected. VGA, Mini DisplayPort and HDMI. The maintenance hatch is very large. Despite its high capacity, the battery appears to be rather compact. 87 Wh are quite a lot. Many components can be upgraded. The fan is both inconspicuous and capable. 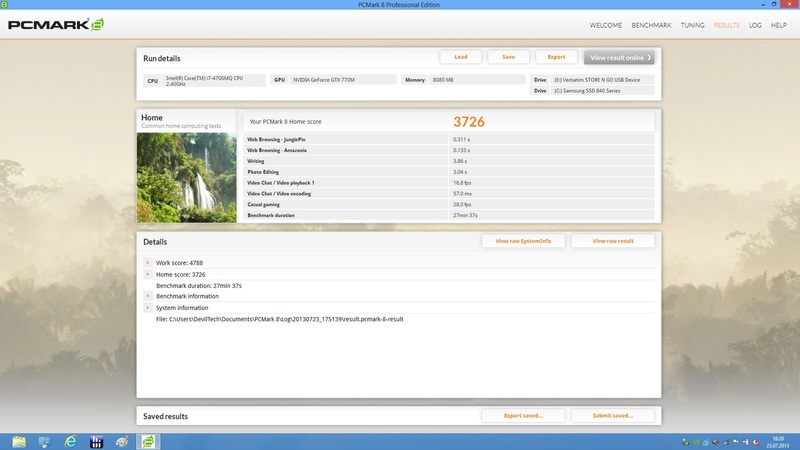 The laptop can be configured with different SSDs. 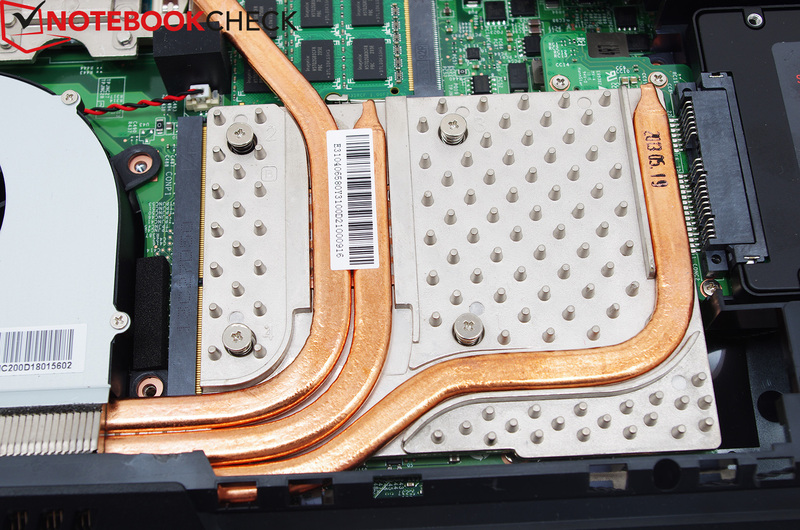 Heat pipes transport the hot air to the fan. Our test device comes with 8 GB of DDR3-RAM. There is a second drive bay. The fan is completely accessible. Rubber feet keep the laptop in place. The laptop remains rather cool and quiet. A different keyboard backlighting system such as that of the MSI GT70. The gargantuan size and weight of the Fragbook DTX.